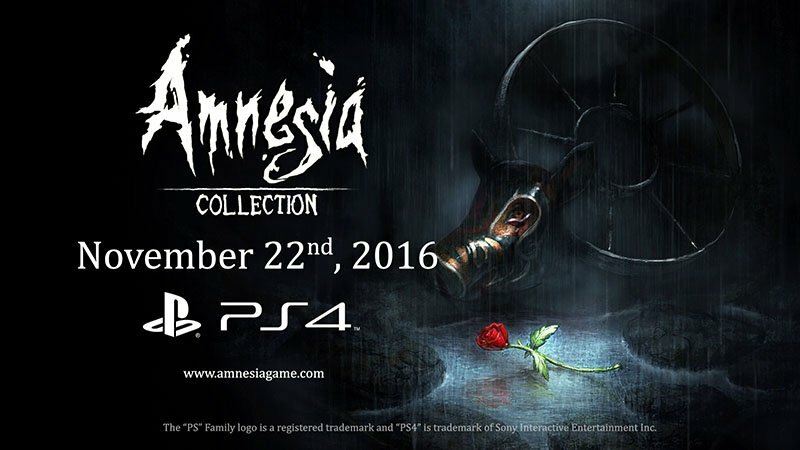 After our announcement last week that the Amnesia: Collection was coming to the PS4, a bunch of questions appeared across the internet. Because of this, it feels like time for a little FAQ. In case you missed it, here's a link to the trailer. It will cost 29.99 dollars and have a 10% discount for PS+ members the first couple of weeks. Will there be any differences compared to the PC version? The biggest difference is that the game will have trophies on PS4. There will also be some minor changes to menus and GUI to make it a bit more console friendly. Other than that the game will look and sound exactly the same as on PC. Will it come to Xbox One as well? We would like it to, but for this release we only had the resources to handle one platform at a time, and we're already familiar with the PS4. What about a physical release? It would be awesome to do that, but there are a bunch of complications. We've already had a few publishers mail us to express interest in a boxed version, so we'll pursue those and see what happens. English voice only, and subtitles for English, German, French, Spanish, Italian, Brazilian Portuguese and Russian. Afraid not, it is simply too difficult for a number of tech and legal reasons. 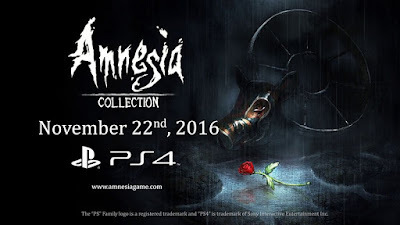 Will Amnesia have VR support soon? We're not planning VR support for Amnesia. It would require substantial re-engineering, not to mention redesign of the gameplay. What is the resolution and framerate? All games will be 1080p. The Dark Descent and Justine will run at 60 fps. We are having some performance issues with A Machine for Pigs and might have to settle with 30 fps for it. Our porting team is working hard to get it up to 60 fps though, but we cannot promise we can do it. Will the game have a frame around it like in the trailer? No. That was just to make it clear that it wasn't our footage being shown, it belonged to the streamers we featured. Sorry if we made this unclear. Why does the trailer only contain old Youtube footage? There's already a huge amount of gameplay footage for Amnesia online and it felt boring to just do another standard trailer. We felt we wanted to make something different and got the idea of showing off some early Let's Plays, given that Amnesia was released around the time of the first explosion of the Let's Play phenomenon. The idea was to make something similar to this one for the movie [Rec]. Why does the trailer only contain The Dark Descent footage? Because the other two games came afterwards when Let's Plays were already a widespread phenomenon. We wanted some early videos that captured more "genuine" reactions. We'll release a proper trailer closer to publish date. That should cover most of it! You can also find more information in this Playstation blog post. And if you have more questions, ask them in the comments!